While most people take daylights savings time and warmer weather as a sign that spring is near, I look to new beauty launches, like Anastasia Beverly Hills’ Riviera Eyeshadow Palette. The makeup brand’s newest launch includes loose highlighters, setting spray, and of course, a highly anticipated eyeshadow palette. Without a doubt, the shining star of this spring lineup is the palette—an irresistible, 14-pan offering with a killer combination of striking colors, making it one of ABH’s most picturesque eyeshadow palettes yet. I can literally scroll down its hashtag on Instagram and look at pictures of it all day—it’s really that beautiful. I’m happy that I had decluttered my makeup stash during spring cleaning because this collection is calling my name. Anastasia Beverly Hills is best known for its groundbreaking eyebrow products, but its eyeshadow palettes are also fan-favorites. In the past, ABH has gained the love of its fans with coveted palettes such as Norvina and Soft Glam. However, it’s evident that the brand is looking to explore uncharted territory with Riviera. The palette includes seven metallic and seven matte shades, named after beautiful travel destinations like Seychelles and the Bahamas. What better way to explore colorful makeup than through eyeshadows inspired by stunningly exotic places like these? Anastasia Beverly Hills sent me its new Riviera palette to review. I was speechless when I first saw pictures of the palette, and then I jumped for joy when I finally saw it in person. From the first time I laid eyes on Riviera, I knew I was going to have the time of my life stepping out of my color comfort zone. The palette includes a few neutral shades (for blending and transitioning between colors), but Riviera gives my overabundance of neutral palettes a run for their money. It was so hard to decide which colors to play with—they’re all so pretty. In the spirit of exploration, I used one metallic shade (Seychelles) and three matte shades: Coastline, Bahamas, and Cannes. I expected the metallic shades to have a lot of fallout, but it was very minimal. I’m also super impressed by how smoothly the metallic shades apply. I’m always hesitant to try out of new palettes—most colorful eyeshadow palettes, especially, are hit or miss. 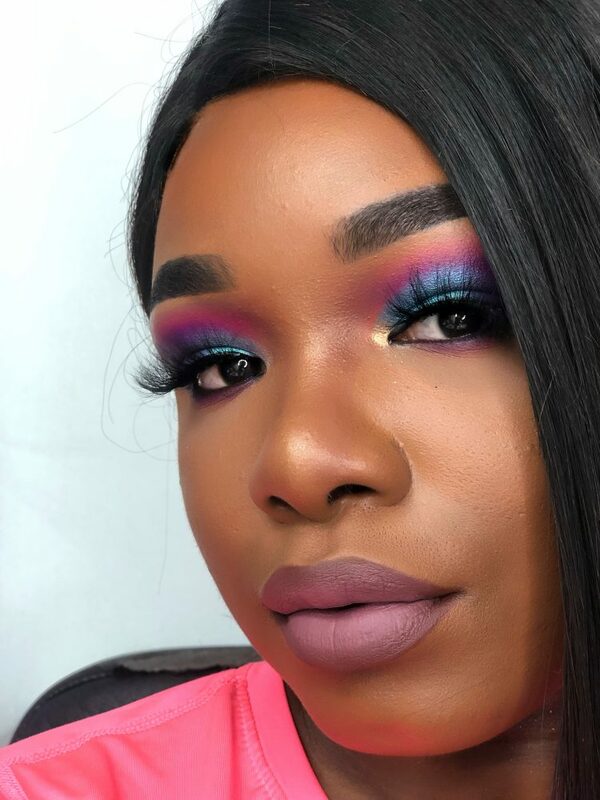 It’s hard to find a bright eyeshadow palette that’s pigmented and blends well because patchiness is usually a major cause for concern when it comes to creating looks with any bright eyeshadow. There’s nothing worse than taking the time to create an eye look just for it to end up looking a hot mess. 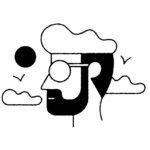 I’m happy to say that ABH delivered in all departments with Riviera. 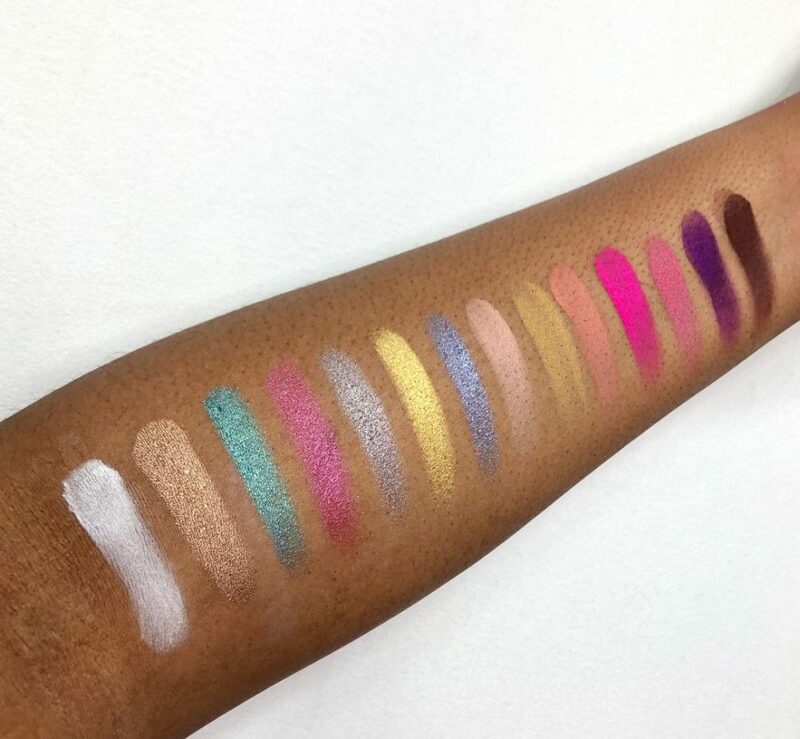 Though I love the intense pigment and texture of the eyeshadows, some colors stain the skin. It’s not a big issue for me; however, I do recommend using an oil-based cleanser or cleansing balm to remove the eyeshadow. I suppose stained eyelids are the price to pay for true color payoff. Manipulating metallic eyeshadow can be pretty difficult because of the texture and small pieces of glitter. Good news—the metallic shades in the Riviera palette apply with ease! You can build up the intensity without the shadow creasing. I thought I would have to use a wet brush to help the metallic shadow stick, but to my surprise, it did the job on its own. 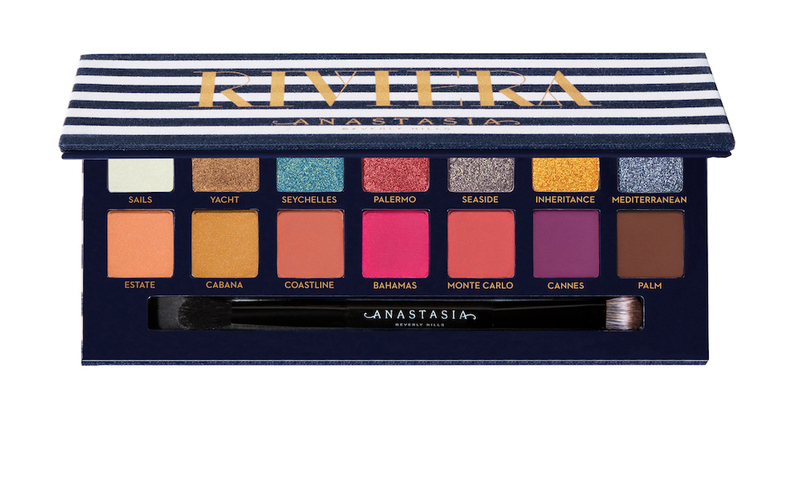 In the past, Anastasia Beverly Hills has played it safe, but the Riviera palette is fearless and beautiful. Generally speaking, I stick to neutral shades for my lids, but this eyeshadow palette has inspired me to channel my inner artist. I already have quite a few eye looks that I’d love to create using this palette just in time for spring. 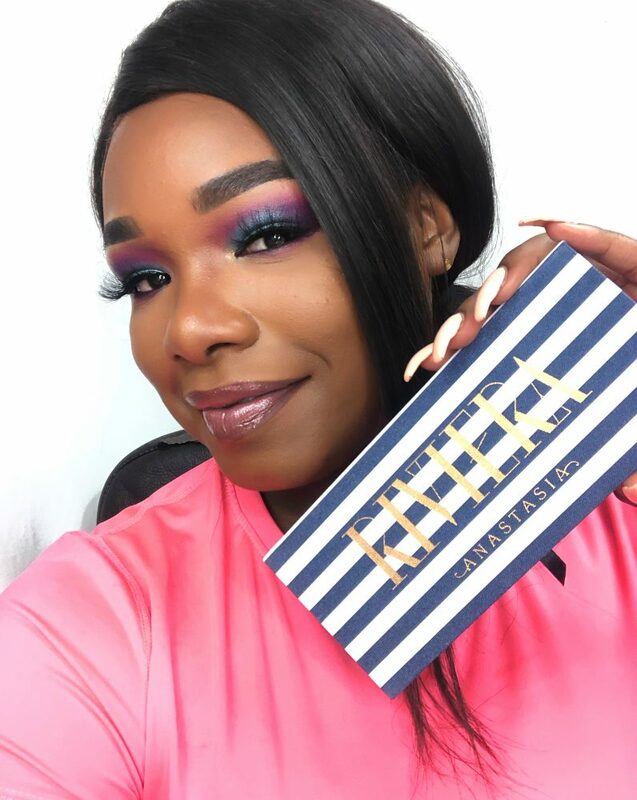 In my humble opinion, ABH’s Riviera palette is a must for your collection. The Anastasia Beverly Hills Riviera palette is available now at Sephora for $45. If I were you, I wouldn’t hesitate to buy it.